Adventure East Nusa Tenggara, Expedition tours to Komodo,Flores,Lembata,Alor,Timor, East Nusa Tenggara islands, Indonesia. Arrival at Komodo Airport in Labuan Bajo in West-Flores. Our english speaking guide will pick you up at the airport and will take you directly to the pier of Labuan Bajo. The boat there will leave for the island of dragons, Rinca. Lunch is provided on board during the two-hour-sail to the home of the Komodo Dragon. Once arrived at Rinca Island a trekking tour of approx. 2 hours awaits, that is the best opportunity to see dragons and their prey, passing the dragon nests and out into the sunshine across an exposed savannah studded with lontar palms. Reaching the top of the exposed slopes you will be rewarded with breathtaking views. In the afternoon you return to your boat. Dinner and overnight on the boat. In the early morning after breakfast you sail from Rinca to Komodo Island. At Komodo Island you start for a medium trek of approx. 1.5 hours. Passing a waterhole you might see some Timor Deer, wild pigs and Komodo Dragons. You will climb Sulphurea Hill and Frigate Hill, where a magnificent view across the islands, bays and beaches awaits. After the hike you return to the boat and proceed to the Pink Beach. This peculiar beach gets its color from red coral fragments. It is definitely a great place to spend some time by just laying back or enjoying the spectacular underwater world by snorkeling. Lunch will then be provided on board and in the afternoon you sail back to Labuan Bajo. Dinner and overnight at Puri Sari Beach Hotel or similar. After the breakfast at your hotel you drive with our AC-coach up to Ruteng. On the way there you visit the mirror stone cave (stalactites and stalagmites), the Lembor rice field, a village at Golo Cara and the unique Lingko rice fields, which are arranged in circular terraces like a spider web. Dinner at a local restaurant and overnight at MBC guesthouse Ruteng or similar. After the breakfast you visit Golo Curu with its very nice scenery over Ruteng town and the rice fields. 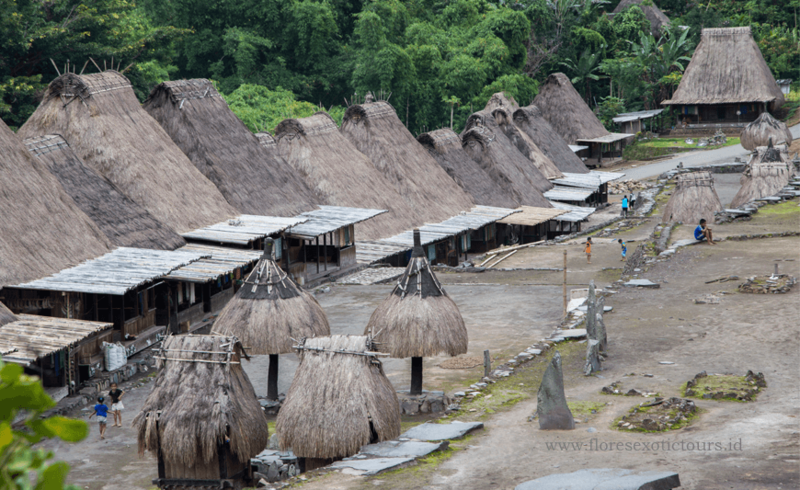 After that, you proceed to the traditional village of Ruteng Puu before you leave for Bajawa. On the way there you will make several stops in Ranamese lake, Aimere the centre of “Arak”-production and the traditional village of Bena. Dinner and overnight at Villa Silverin or happy-happy hotel or similar. Today you drive to Riung in the very morning and take a boat leaving from there. At first you sail to Ontoloe Island in order to watch numerous flying foxes and bats. Afterwards you sail to Rutong Island, where you can enjoy the crystal clear water by snorkeling and swimming. Lunch will be provided on board and in the afternoon you will return to Riung. Dinner and overnight at Pondok SVD Riung or Del Mar Cafe, Riung. In the early morning at 04.00 am the car takes you to the three colored lakes of Kelimutu, one of the most spectacular and mysterious sights in Indonesia. You will witness a beautiful sunrise. Then you return to the hotel and have breakfast. After that you visit the traditional village Jopu and afterwards proceed to Paga and Maumere. Dinner and overnight at Sea World Club Maumere. After the breakfast we will take you to the pier of Larantuka and you continue the trip by public motor boat via Waiterang to Lewoleba (90 min). On the way you will enjoy the beautiful scenery of tiny island and mountains and have a chance to get in contact with the local people. Lunch will be provided in Lewoleba before you continue by 4 wheeldrive to Lamalera in the south of Lembata Island. Dinner and overnight at a basic guest house in Lamalera. Start the day by enjoying your time on the beach before you start an extraordinary adventure with local boat to see the sperm whale or other marine animals ie: dolphins, manta rays and turtles. If you are lucky today you can directly witness how the indigenous people hunting and catching a whale only using traditional gear. In the afternoon you return to the village. Dinner and overnight at at a basic guest house in Lamalera. If you are unlucky at first day, you have another chance to experience this unique adventure. You need to be patient, if the people start shouting Baleo…Baleo…Baleo, that is a good sign, because it means they saw the whales crossing. Everyone gets to his boat as fast as possible to go hunting. The women go to the beach to see their men and wait untill they come back. If they succeed cathcing a whale it would a big party on the beach. In the afternoon you then drive to Lewoleba. Dinner and overnight at Lewoleba Hotel. After the breakfast at the hotel you visit the traditional villages Takpala and Mombang and gain an insight of the indigenous peoples life. You continue to Mali Beach with its beautiful panorama you can spend your time relaxing and swimming. In the afternoon you return to your hotel. Dinner and overnight Pelangi Indah Hotel. In the morning we provide transfer to the local harbor for you to embark a wooden boat. The boat takes you to some islands nearby such as Pura Island and Buaya Island. Enjoy these loveley islands and their paradisaic beaches with swimming and relaxing or discover the underwater world by snorkeling. Lunch will be served on board. In the late afternoon cruise back to Kalabahi. Dinner and overnight at Pelangi Indah Hotel. If time permits you have the chance to visit the local market before you drive to Mali Airport to catch your flight back to Kupang. On arrival you first check in at Kristal Hotel and after lunch you will visit Lasiana Beach to watch the local process of producing palm sugar. Afterwards you continue to Oebelo village to witness how the locals make and play the traditional instrument Sasando. In the afternoon you return to the hotel. Dinner and overnight at Kristal Hotel. After breakfast at the hotel we provide transfer to Eltari Airport of Kupang for you to catch your flight. Advice: The best time to join this program is from April – June, and September – October.